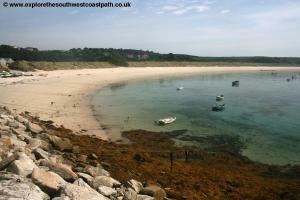 St Martins is the third largest of the Scillies and has a wide variety of scenery along it's beautiful coastline. 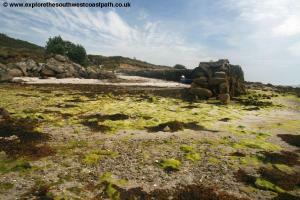 The south coast has several good sandy beaches whilst the north coast is more rugged and rocky. 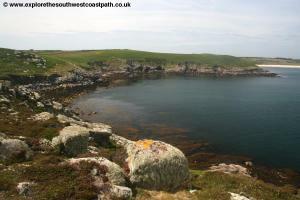 You can also walk out to the uninhabited White Island at low tide and there are good views of Tean from the western most point of the island. 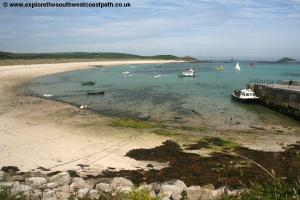 St Martins has regular boat services from St Marys (normally daily). From the other islands, check the boards for the various boating companies as trips do not typically run daily. 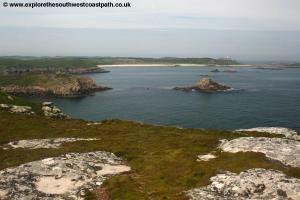 There are no ferries to St Martins from the main land. Note that as with some of the other islands, the arrival and departure points can vary. 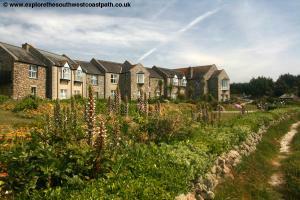 At high tide you'll typically land at New Quay close to Higher Town on the south coast of the island. 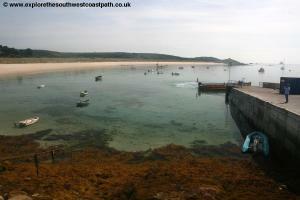 However at low tide boats normally use the quay at the very west of the island (near Lower Town). This means if you are planning to follow this walk around the whole island you'll likely have to walk some parts twice to complete a circuit as it's common to arrive and depart from different quays. Despite it's small size there is quite a good choice of accommodation on St Martins. St Martins Hotel is the only hotel on the island and is just behind the quay at Lower Town at the western point of the island. Polreath Guest House is a family run guest house which is close to the quay on Higher Town.Fuchsia Cottage Holidays also offer bed and breakfast accommodation. 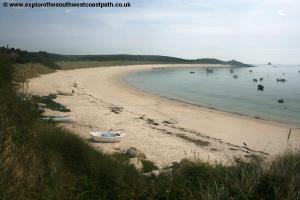 There are also a range of Self Catering properties available for rent, details of which can be on the Where to Stay on St Martins page. 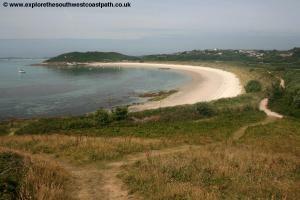 Finally there is a campsite, St Martins Campsite which is open from April to October. 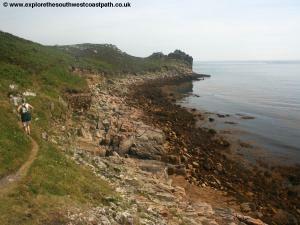 This walk begins from the ferry landing point on the south of the island, New Quay near to Higher Town. However depending on the tides if you are travelling to St Martins from one of the other islands you may be dropped off at either New Quay (at high tide) or Lower Town Quay, at the western tip of the island at lower tides. 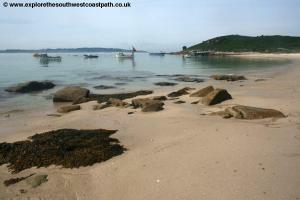 From New Quay, head along the quay wall along the road, with the beautiful sandy beach of Higher Town Bay to your right. Once off the quay, take the first fork on the right, still a road, going behind a couple of boat houses. Just past these there is a narrow path down to the beach which you may prefer to walk on for the first part of the walk (if you take this route, rejoin the main track at the far end of the beach). 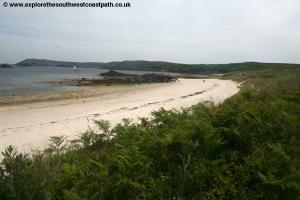 Continuing on the main track you pass behind Higher Town Bay to the right, with itâ€™s lovely sandy beach. 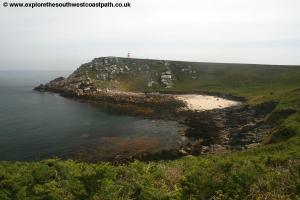 Keep with the path as it briefly goes away from the back of the beach and passes Adams Fish and Chips. Ignore the track off to the left and keep to the main track ahead, soon returning to the back of the beach. 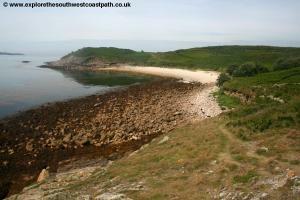 At the eastern end of the beach, the path forks, with the main path keeping ahead, with a smaller path going to the right. Turn right here, on the smaller path. 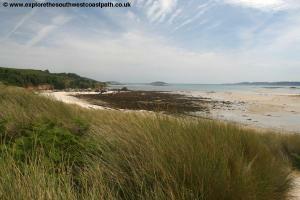 This soon joins the path up from the beach to the right if you've followed the route along the beach. 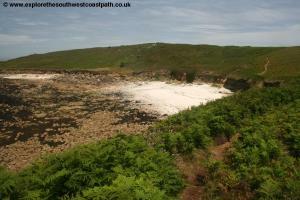 There is now a narrow coast path right along the top of the cliffs (and a slightly wider path a little further back if you prefer) which very soon brings you round to another small beach (Perpitch) which has some sand at low tide, but is rocky a low tide. Offshore you have fine views of Great Ganilly, the largest of the uninhabited Eastern Isles. Continue on the obvious path along the back of the beach, which briefly leaves the edge of the cliffs to go round a few low buses, quickly returning to the cliff top. 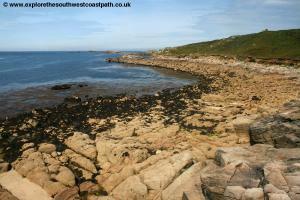 Round Brandy Point (presumably named after smuggling) and continue on the narrow coast path along the coast. This part of the island is mostly heathland and rocky outcrops inland and is more rugged than the coast we have been following so far, becoming rocky. Keep on the obvious coast path right along the cliff top, with the sea on your right as you follow the coast as it rounds the eastern tip of the island. 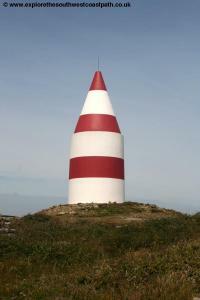 Ahead you can see the daymark, a red and white striped post on the top of St Martins Head, the highest point of the island and acts as a navigation beacon. From the beacon you have wonderful views of most of the island, as well as the other island nearby. 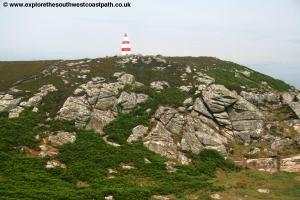 Once at the daymark continue on the more coastal of paths, with the sea still to your right, initially through a rather rocky area, and not the wide track that goes more inland. Soon you come to another sandy and rocky beach, called Bread and Cheese. 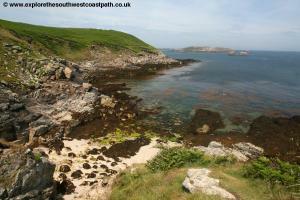 Continue on the low path behind the next little bay. 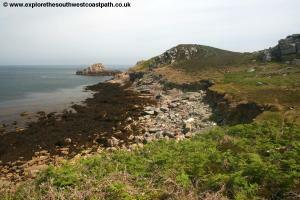 Ahead is Burnt Hill and the main path cuts this off, but you may prefer to take the rather narrow coast path that sticks right to the coast. 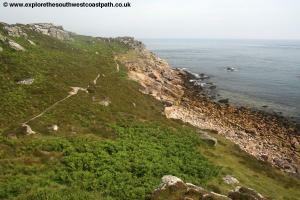 Continuing west you keep to the main undulating coastal path, right along the edge of the coast. 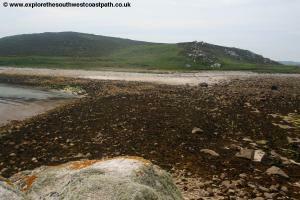 Soon you follow the path around another little headland, Turfy Hill. 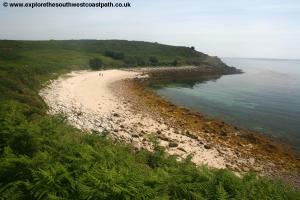 Once round Turfy Hill the path soon brings you to another lovely beach, Great Bay. 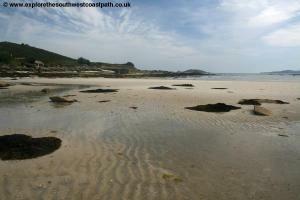 This is a sandy beach although again there are rocks at lower tide along the south edge of the beach. 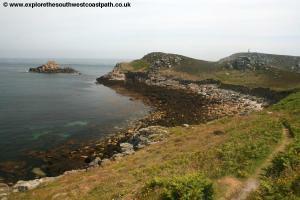 The coast path is a gentle path along the back of the beach here and soon joins a wider track coming from the left, but keep ahead here still right along the edge of the coast. 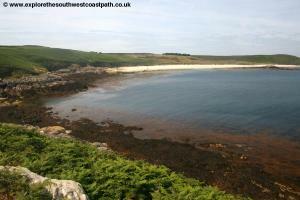 You pass another sandy beach, Little Bay, which unless it's high tide joins to the main Great Bay. 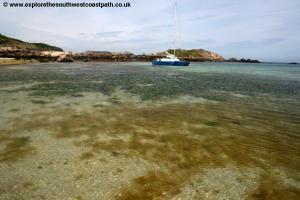 Rounding Scilly Point you have another sand and rock beach which at low tide joins St Martins to neighbouring White Island. 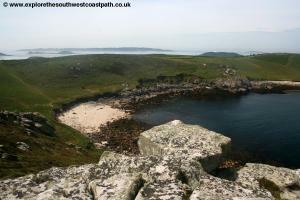 It is possible to climb over the rocks to reach White Island and explore it as well, but it is an awkward walk (needing to cross over many rocks) and care is needed to avoid getting cut off by the tide. 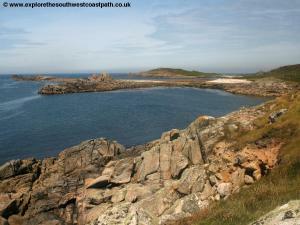 Keeping to the main coast of St Martins you keep to the good wide coast path going around the northern tip of the island, Top Rock Hill. 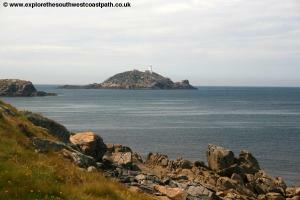 At the north western tip of the island more rocks join St Martins to a rocky islet called Pernagie Island. One of the boatmen on Scilly told me that the difference between and island and islet is the former is covered by vegetation year round whilst the latter is not. 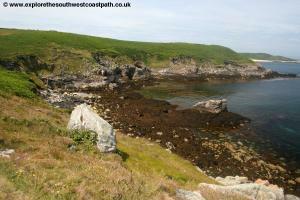 Continuing on the main coast path you cut off the edge of Pernagie Point and round the bay of Porth Seal, a mostly rocky beach. 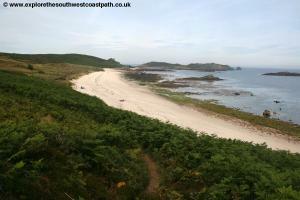 Keep to the lower path here, as close to the coast as possible, as another wider track will take you inland. Follow the low path around Tinkler's Point soon reaching the only hotel on the island, which you pass in front of it, to reach the Lower Town Quay, where boats generally arrive and depart at low tide. 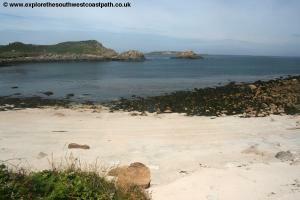 Pass the quay and then briefly walk along the back of the beach and after passing the rocky area to the left, take the path up to join the main track just a little back from beach. Follow this round past a small boat yard and when the main track turns off to the left, turn right on another track which you then follow along the back of the beach, Neck of the Pool, along the south coast of the island. You soon pass the campsite on the left and just after this the path forks, turn right on the wide track. This soon meets another track going left to right, with the track to the right going onto the beach. Turn left here and then shortly fork right on the wide track. 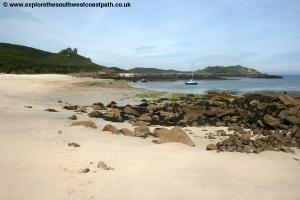 Very soon after this point turn right again on the footpath that runs alongside the beach. This continues along the back of the beach for around a quarter of a mile where it then turns left heading away from the coast. 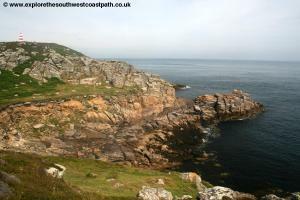 Here you have a choice of routes, as there is no footpath along the cliff top from here back to Higher Town. The first choice is to walk along the beach. 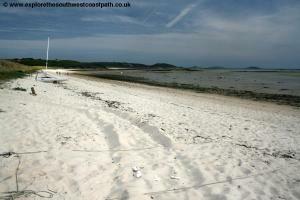 When the main track turns to the left, you can take a narrow path to the right down onto the beach. 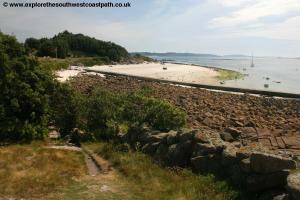 You can normally then follow the beach round to Old Quay, but this does involve climbing over some rocks in places. The Old Quay is not much used anymore (hence the name). 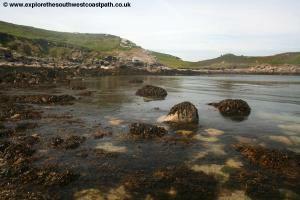 From here and only at low tide, it is possible to continue on the rocky foreshore around Cruther's Point, but it is difficult and not recommended. Instead, from Old Quay take the track leading up from the quay and when it comes to a junction fork right to return to the quay at Higher Town. The second route is to keep to the main tracks. To take this route, follow the track as it forks left away from the coast, heading due north and keep with it as it turns to the right (ignoring the path off to the left). This track brings you out to the main road across the island, opposite Churchtown Farm. Keep to the track ahead soon passing the shop (St Martins Store) on the right. As the track forks just outside the shop, take the wider left track. When this splits again turn right and follow the track soon passing Carron Farm. As the houses end, follow the main track as it forks sharply to the left and keep to this track to arrive at the quay at Higher Town, where the walk ends. As mentioned previously, this is a circular walk however it is common to have to use a different quay to return, either the one at the Lower Town or at Higher Town. 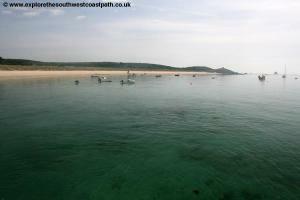 The boatmen will tell you which on the outward crossing to St Martins.